I really like the flavour of sorrel: it’s sharp and green and appley-sour. Common sorrel is easy to grow at home, but you’ll also find it growing wild, small and spear-shaped, in grassy fields and grazing land. The zesty acidity of wild sorrel works beautifully in salads and it makes a sauce that works wonderfully with fish, particularly brill. 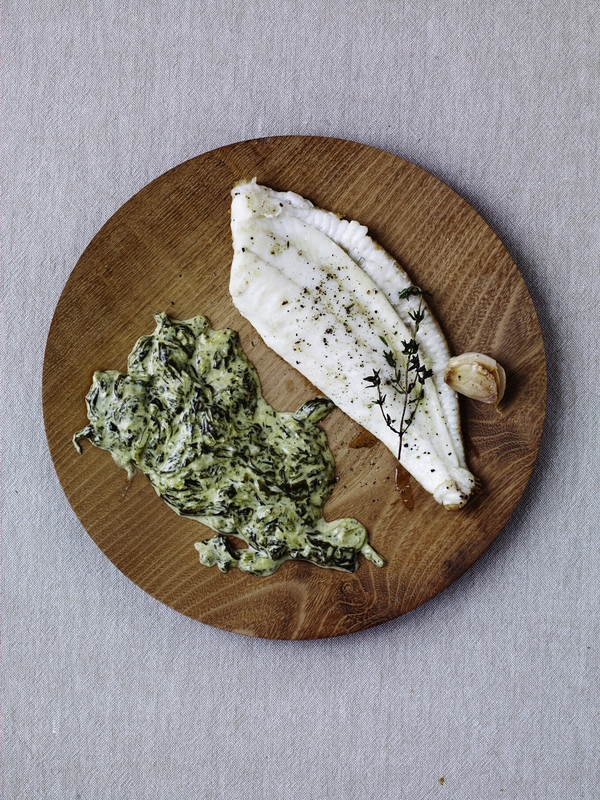 A version of this recipe has been on the menu at a fish restaurant in Dorset that I’ve been going to since I was a child. My mum still orders it every time she goes to eat there. a medium heat. When it is bubbling, add the shallot and cook, stirring regularly, until it is soft and sweet. Pour over the stock, bring up to a simmer and watch it bubble away gently until the liquid has almost disappeared (about 2 minutes). Cut the sorrel leaves into rough ribbons and throw them into the pan. Give the sorrel a stir with a wooden spoon once or twice in the pan to ensure the leaves are nicely wilted. Add the cream, stir, and bring the sauce up to a simmer. Cook for 1–2 minutes, until the sauce has thickened slightly. Season with salt and pepper, then remove from the heat, cover and set aside. Season the fish all over. Heat the olive oil, along with the bay, thyme and garlic, in a large non-stick frying pan over a medium– high heat. Place the pieces of seasoned brill skin-side down into the pan. Cook for 5–6 minutes, until the fish has cooked at least three-quarters of the way up its edge. Use a spatula to turn over the fish, cook for 1 minute more, then add the butter and remove the pan from the heat. Rest the fish in the pan for 1 minute while the butter melts. Place one brill fillet onto each plate with the sauce alongside. It’s lovely served with a bowl of crisp sauté potatoes.